On a paper plate arrange 7 or 8 pretzels. Place a melting wafer in the center of the pretzel. Microwave and heat them until the wafer just starts to melt. (soft to the touch and melted enough to press a M&M down into it but not running off the pretzel.) About 45 seconds. 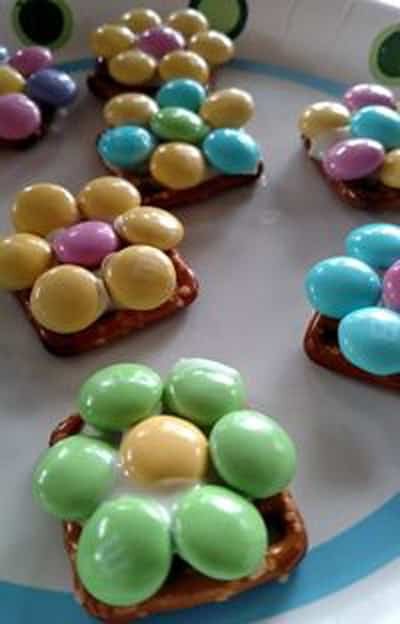 Using pastel M&M’s, place an M&M in the center of the melted wafer and surround with 6 M&Ms of a different color with the “M” side down. Let them harden for a couple hours before storing them in an air-tight container.